Should You Eat Foods with Ingredients You Can’t Pronounce? If a banana had an ingredient label, do you know how it would read? The answer may surprise you. 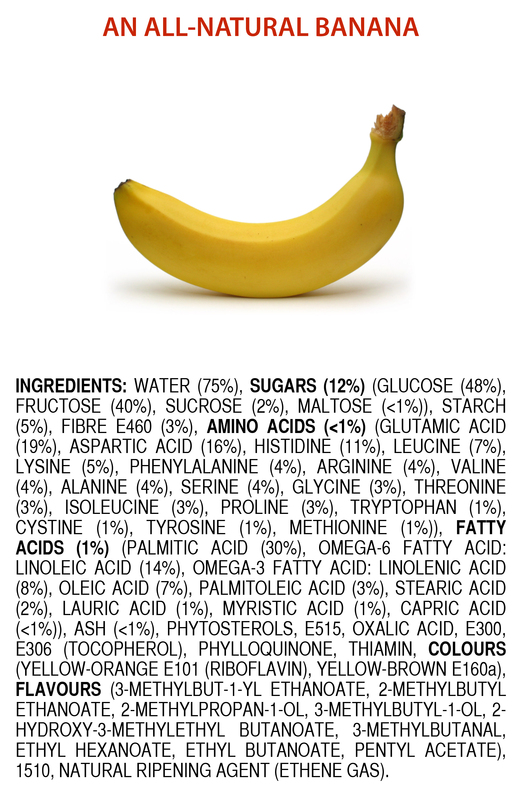 If a 100% natural, non-GMO banana had an ingredient label, this is how it would read: (courtesy of Australian chemistry professor, James Kennedy): Water, Sugars, (glucose, fructose, sucrose, maltose), Starch, Fiber E460, Amino Acids (Glutamic acid, Aspartic acid, Histidine, Leucine, Lysine, Phenylalanine, Arginine, Valine, Alanine, Serine, Glycine, Threonine, Cystine, Tyrosine, Methionine), Fatty Acids (Palmitic acid, Omega-6 fatty acid, Linoleic acid, Omega-3 fatty acid, Linolenic acid, Oleic acid, Palmitoleic acid, Stearic Acid, Lauric Acid, Myristic acid, Capric acid), Ash, Phytosterols, E515, Oxalic acid, E300, E306 (Tocopherol), Phylloquinone, Thiamin, Colors/Flavors (3-Methylbut-1yl, Ethanoate, 2-Methybutyl Hydroxy-3-Methyethyl Butanoate, 3-Methybutanal, Ethyl Hexanoate, Ethyl Butanoate, Pentyl acetate), 1510, Natural ripening agent (Ethene gas). Even if you can’t pronounce their chemical names, most additives are harmless. They are ingredients used to preserve flavor or enhance taste or appearance. They can be artificial or naturally occurring, and include herbs, spices, vinegar, and salt, as well as preservatives, colorings, flavorings, vitamins, minerals, and processing aids. Depending upon the amount of processed and packaged foods you eat, you may be consuming lots of food additives. While some are similar to ingredients you might use at home, others you may wish to avoid. All food additives are subject to premarket review and approval by the US Food and Drug Administration (FDA), unless the substance is generally recognized, among qualified experts, as having been adequately shown to be safe. A food additive may be determined as GRAS either through scientific testing or, for a substance used in food before 1958, through a substantial history of safe use by a significant number of consumers. Consumers are right to question the presence of certain additives in their food. They may feel that some need further testing even though the government doesn’t believe it is necessary. Some people may be sensitive to certain colors or preservatives. But the biggest problem is that when they are numerous, they are a red flag, indicating a highly processed food. The Center for Science in the Public Interest, a consumer advocacy group, has published a list of additives they call Chemical Cuisine, rating them into categories from “safe” to “avoid.” They also recommend cutting back on added sugar and salt, which they feel cause more harm than all of the other additives combined. Eating food with additives is not necessarily dangerous, but a diet full of these kinds of foods means what you’re eating is highly processed and therefore lacking many of the nutritional benefits of whole foods. Beneficial fiber, along with vitamins and minerals, can be lost during processing. Nutrients may be added back at excessive doses or in synthesized forms not shown to have the same health benefits as the naturally occurring kind from whole foods. As an example, when whole grain is refined, a number of valuable components are removed, including the bran, germ, and as many as 16 vitamins and minerals. Only five of these lost vitamins and minerals—B1, B2, B3, iron, and folic acid—are added back when the refined flour is “enriched.” At enrichment levels ranging from about 120 to over 600 percent of what are naturally found in the whole grain, concerns have arisen for those who need to limit their iron or folate intake. A whole foods eating style contains mostly simple foods that contain only one ingredient such as fresh, frozen, or canned produce, whole grains, and dry beans. This kind of eating also may include lightly processed foods such as breads and simple cereals; vegetarian proteins such as canned beans, tofu and tempeh; animal proteins such as fish, and lean poultry and meat; calcium sources such as milk and cheeses; and healthful vegetable oils. Avoid foods that contain partially hydrogenated oil and high fructose corn syrup. If you find these “Red Flags”, you will know that the food contains unhealthful ingredients. Try to choose a more healthful food that is free of these. Avoid foods with a long ingredient list! Look for shorter ingredient lists. Foods with shorter lists tend to be more wholesome. They usually have fewer added ingredients that your body doesn’t need, such as flavor enhancers, preservatives, or dyes. Mary Saucier Choate is a Co-op member and manager for Outreach and Stakeholder Engagement at the Partnership for Food Safety Education. Previous How ‘Bout Them Apples?